"I think so. They helped me understand multiplicity finally and some of the factoring, but I think forcing myself to be in a math environment and work on homework for 45 minutes straight with help that actually is correct helps me mentally a lot better." Thank you again to you & your tutors for all your help! We are so pleased with this program! ~L.F. Our daughter struggled with math. Now with the help of the Mathnasium of South Tulsa, our 7th grader just received the highest honors award for math and also scored the highest for math throughout her school's entire 7th grade class. We are excited and thankful that both of our daughters are enrolled in Mathnasium now. My husband and I want to thank you and your awesome staff for everything you have done to help children believe in themselves and grow in confidence as they learn to achieve more than they ever dreamed. 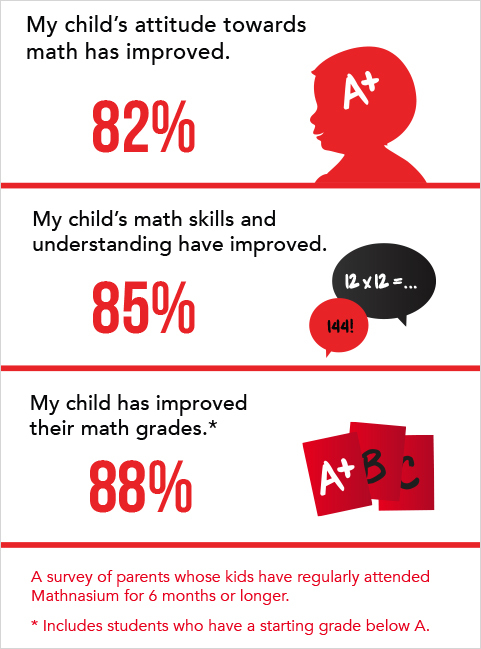 I enjoy sharing with everyone the amazing results we've experienced with Mathnasium Learning Center because your system works better than we ever anticipated! Again, thank you so much! I wanted to thank you for helping my son this past year. You and your staff gave him something he could not get in school, and if you think it was only skills to pass his math you are wrong. You gave him hope! When I started to write this message to you, I thought about the times that I would asked Miles " What did you like the most about Mathnasium?" He replied "They believed in me and gave me hope to know that I could do it!" Those words were Inspirational to me! To have a child that is failing in math is one thing, but to have a child feel hopeless, that is another. I began to feel as hopeless as he was. I felt like he was not going to succeed. When Miles passed his math course I was elated and he felt hope! So thank you, Vane, and the staff at Mathnasium. You are an inspiration where it was least expected. I don't know what kind of "mojo magic" you do here, but my girls beg me to come to Mathnasium every day! I've never felt more confident going into a math class! My daughter really likes math now and it use to completely frustrate her. She says she had fun after she leaves Mathnasium. It's fun for her to learn and understand math. Our oldest daughter has struggled with math through the years. Due to this struggle, her ACT scores in math were very poor. We signed her up for another ACT course in town hoping to improve her scores, but unfortunately her score didn't go up 1 point. Our other daughter is enrolled in Mathnasium and, as a result, is getting an A in math, so we decided to try Mathnasium's ACT math review for our oldest daughter. After a 9 week comprehensive class, we are very excited to report her score went up 5 points! We are thrilled and so is she! Mathnasium has been a tremendous help to our family. Vane and his staff are a pleasure to work with! From the very 1st night after attending mathnasium, our daughter came out of there so excited and thrilled with herself! She has never been excited about math and she certainly has lost self esteem at her school because she had been "left behind" and was struggling. (She is 8 yrs old and in 3rd grade) From that 1st night, she climbs in the car and wants to do math games all the way home, in the shower at home, and even after she's in bed (and needs to be quiet and go to sleep!) all she wants to do is math now! She thinks math is fun and easy now. The instructors are great with her and they explain her progress any time I go in to pick her up. The initial evaluation was VERY comprehensive. We were impressed with how much they truely understand our struggles and are able to go right back to the basics and begin reinforcing a stronger foundation that is needed before building on top of it. We have only been coming there for 3 weeks, but I feel certain her teachers at school will notice the change very shortly. Thank you so much for all your team is doing for our daughter and her future!!! I LOVE Mathnasium and can't begin to say enough nice things about it! My son's grade in Pre-AP Geometry went from a C to an A in a very short time after enrolling in Mathnasium! The staff are wonderful and my son has NEVER ONCE complained about having to go to Mathnasium....I wasn't expecting that at all! Whatever you're doing, keep doing it! Keep up the good work, you have a a truly positive effect on my son. My daughter is really enjoying her sessions at Mathnasium and asked if she could go there daily !! Thanks for sparking that enthusiasm and confidence. Thank you for all you guys have done for me! I would be so far behind in math if I didn't come here. My daughter didn't want to attend before she started, but now loves going. Thank you and your knowledgeable staff so much for everything you've done! Because of our decision for our daughter to participate in Mathnasium, it gave her that extra boost to not only help her score a 33 on the ACT, but also qualify as a National Merit Scholar. It was exactly what she needed and we cannot thank you all enough. I would highly recommend Mathnasium! It has been a huge blessing and we are so thankful for everything. We moved to Jenks this year and knew they had a reputation of tough academics. Our son, hadn't taken Algebra I in over a year and was scheduled to be in pre-AP Algebra II as a freshman in the fall. We decided it would be a good idea to brush up on his skills to get ready for the tough year ahead so we brought him to Mathnasium in South Tulsa over the summer. He ended up getting a 100% on his second exam in the class! We couldn't be more proud! Thanks, Mathnasium!! !